On Sunday 3rd June, Kenilworth were on their travels to Birmingham to play Olton & WW in the Arden Sunday league Division Three fixture. Both sides also immaculately observed one minute’s silence in honour of former first team captain, Neil Goodman, on the first anniversary of his death. Olton chose to bat first and Kenilworth’s young seam attack of Matt Dadswell and Max Howard kept the Olton opening pair quiet, after nine overs, they were 9 for 0. The openers had reached thirty when Will Machin, who had replaced Dadswell, had Arshad caught by Max Howard for 9, then accounted for fellow opener Miar in the same fashion, again caught by Max Howard at mid off for 15, Olton now 46 for 2, then with next ball Machin trapped the next man first ball lbw, the hat trick ball was kept out though, as young Machin was on fire, a fourth wicket for him left the home side on 50 for 4, that became 50 for 5 when Darius Potten Ravenshad picked up an lbw in the next over. Spinner Charlie Stranks replaced Machin, he too picked up a wicket via another catch by Max Howard, this time on the boundary. Stranks got a second, thanks to a smart catch by Dave Edmunds, Olton now 137 for 7 with two overs remaining of their forty. Trying to field the ball off the last ball of the home side’s allocation, Danny Boneham suffered a bad shoulder injury, and after medical help he was taken by ambulance to the local hospital, meaning he would be unable to bat. Olton finishing on 148 for 7. Wicket takers for Kenilworth were Will Machin 4 for 26 off seven overs, Charlie Stranks 2 for 26 off seven overs and Darius Potten Ravenshad with 1 for 34 off eight overs, Griffin with 38 not out and Rogers Collen 26 the best of the home sides batting. With one less batsman, Kenilworth went out looking to win their first Sunday game of the season, openers Dave Edmunds and Pat Howard opened up, and began the reply in positive fashion, after four overs the visitors were 35 for no loss, but both openers fell with the score on 35, Howard first for 15 and Edmunds for 11. Theo Mannion and Elliott Haynes Sorrell added 21 for the third wicket, before Mannion was bowled for 5, Charlie Stranks joined Sorrell, both looking in good touch before Stranks fell lbw for 16 Kenilworth now 81 for 4, Sorrell was also out lbw for 20, now 84 for 5, now Dan Horner and Darius Potten Ravenshad had the task of getting their side home, but some tight bowling kept the visitors in check, Ravenshad fell to Collen for 6 and Horner was stumped for 16, the visitors struggling on 111 for 7 with overs running out, when Will Machin was out with the score of 113 for 8, last man Matt Dadswell joined Max Howard, as the opening bowlers had five overs to block to get the losing draw, the pair managed this with no alarms, the visitors ending on 115 for 8 from their forty overs to achieve a draw. For Olton, Stoykovski 2 for 14 and Suresh with 2 for 26 restricting the Kenilworth batsmen, on a day that will be remembered for Danny Boneham’s unfortunate injury, we hope he recovers soon. 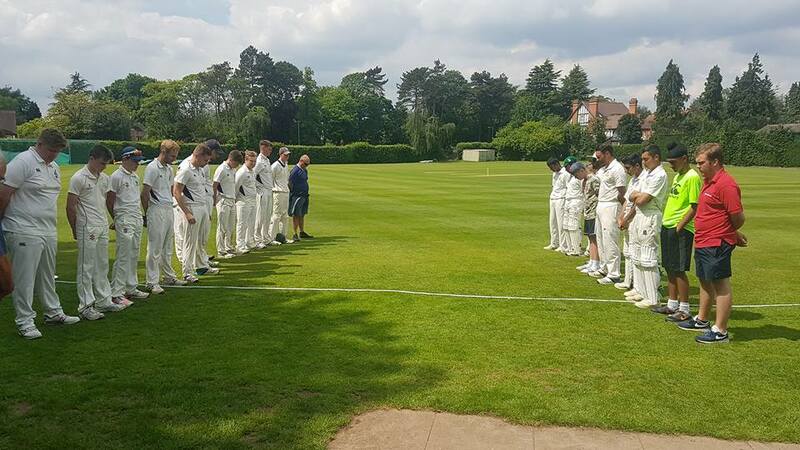 Players from both Kenilworth and Olton & WW observing a minute’s silence in memory of Neil Goodman on the first anniversary of his death. Thank you Olton for participating in it. It meant a lot to Kenilworth CC.